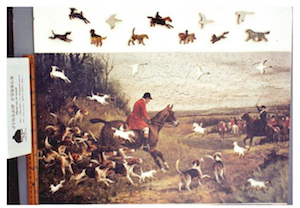 "The puzzle consist of 467 interlocking pieces, many cut in her unique designs of birds, cats, horses, and, of course, Golden Retrievers in various poses. It features a signed print entitled "The Outing" depicting a Golden Retriever female and five puppies playing in the grass." 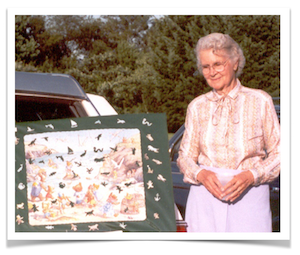 From the Puzzle Parley.org "Rachel Page Elliott (1913-2009), took up cutting wooden jigsaw puzzles when she was in her seventies. She soon became a top notch puzzle maker. In 2006 the Guinness Book of World Records recognized her for creating the jigsaw puzzle that sold for the highest price ever ($27,000) at a charitable art auction. For twenty years she shared her techniques, artistry, and insights about making jigsaw puzzles with accomplished puzzlers and novices alike. Her dedication to fostering a community for the open exchange of ideas led to the first Puzzle Parley in Concord, Massachusetts in September 1994. The first informal Puzzle Exchange took place in Salem, Massachusetts at Puzzle Parley X in 2010. The idea took hold and was formalized in 2012. The exchange at Puzzle Parley 2016 was our fourth." From the Guinness World Record "The record for the most expensive jigsaw puzzle sold for a charitable art auction to benefit a non-profit organization The Golden Retriever Foundation at a bid of $27.000 (£14.589). 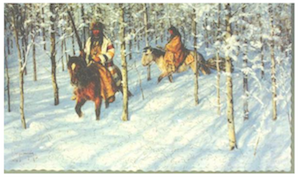 The hand-crafted wooden jigsaw puzzle was custom made by Rachel Page Elliott (USA). The charity event was held at the Eisenhower Conference Centre, Gettysburg, Pennsylvania, USA on 28 September 2005. At the time, Rachel Page Elliot was 92 years old. 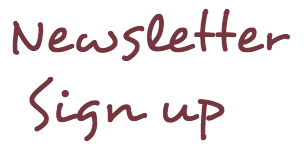 She has lectured around the world, and just updated her world-renown book and video on canine anatomical structure and movement. In puzzle circles, she has received national awards from her fellow puzzlers and is renowned for her detailed craftsmanship. 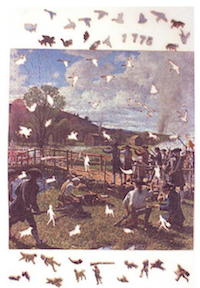 The puzzle consist of 467 interlocking pieces, many cut in her unique designs of birds, cats, horses, and, of course, Golden Retrievers in various poses. It features a signed print entitled "The Outing" depicting a Golden Retriever female and five puppies playing in the grass. (A photo is available upon request)." 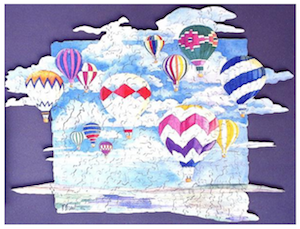 Rachel Page Elliot started sharing her passion for wooden jigsaw puzzles in her 70's. That is amazing because she continued to be involved in the jigsaw puzzle hobby for almost 20 years. Truly living the dream, she has contributed to the idea of an open exchange which let to forming Puzzle Parley Organization. The 4th Exchange was in 2016.